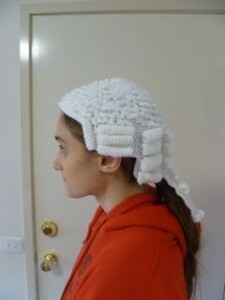 Barrister’s wigs cost upwards of $1,500. 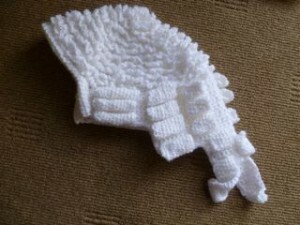 That’s a lot of money for a young barrister to pay. My version costs significantly less and doesn’t involve terrorising any horses. This pattern is written in American notation. It only requires one 100 gram ball of 8 ply. Use a 4mm hook. The colour depends upon the desired effect. I recommend using white wool for a brand new wig, beige for an old wig and grey for a very old wig. Fasten off and sew the end row to the row five rows above to form a curl. Now join the wool to the opposite end of row 46, sc 5 and turn. Sc in each sc for 15 rows. Fasten off and sew the end row to the row five rows above to form a curl. 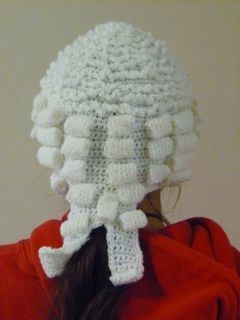 Join the wool near the side of the face and sc rows around the face for five rows, then sew the end to the main body of the wig to form a front and side curl. Starting at the centre and working in a spiral following the pattern of stitches, join the wool, slip stitch, chain 6 and then slip stitch a couple of stitches away. Don’t do it too densely (that’s what I did in the centre and it doesn’t look as good). 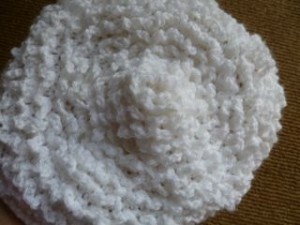 Chain 6, slip stitch in the first chain to form a ring. Sc around for 12 rounds. Fasten off. Sew three of these curls to each side of the head as shown in the photograph. 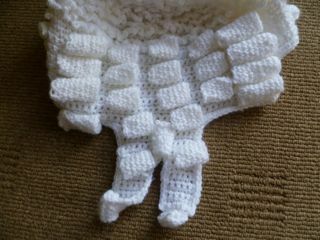 Chain 8, slip stitch in first chain to form a ring, sc around for 9 rounds. Fasten off. Sew four of these, one on top of the other, to each side of the head, just to the back of the side curls (if this is confusing look at the photos). Chain 8, slip stitch in the first chain to form a ring, sc around for 6 rounds. Fasten off. Sew these in three rows of three, right at the back of the wig. Then beneath, have two rows of two on the narrower part of the wig, with one upright curl in the middle (it’s hard to describe, follow the photos).